"A thick slice of moist pumpkin bread Starbucks®-style is the perfect companion for your morning cup of joe! 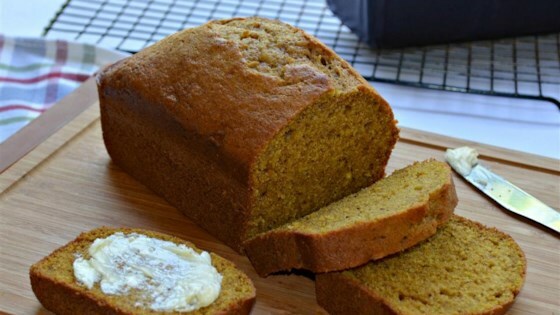 Many other pumpkin bread recipes produce sad, squat loaves - but not this clone. Here's a custom formula that makes enough batter to fill up a medium loaf pan. And when the bread is done, you'll slice the beefy loaf into eight thick square hunks of goodness that perfectly mimic the weight, color and flavor of the real thing." Preheat oven to 350 degrees F (175 degrees C). Grease a 8-1/2x4-1/2-inch loaf pan. Combine flour, baking soda, nutmeg, cinnamon, cloves, baking powder, and salt together in a large bowl. Beat eggs, white sugar, brown sugar, and vanilla extract in a large bowl with an electric mixer on high speed until combined, about 30 seconds. Beat in pumpkin and oil. Add flour mixture; mix until batter is blended and smooth. Bake in the preheated oven until the top is dark brown and a toothpick inserted into the center of the bread comes out clean, about 70 minutes. Let cool in the pan, about 30 minutes. Invert onto a wire rack and slice it into 1-inch thick slices. This bread freezes perfectly. Simply seal any leftover slices in a resealable plastic bag or wrap them in plastic and pop them into the freezer. To serve, microwave one frozen slice on high for about 45 seconds and it'll taste like it just came out of the oven! Good flavor, but I would not compare it to Starbucks. It was not very moist. I thougt this was good. I used pumpkin spice and the only addition I made was to sprinkle 1/2 cup of toasted pumpkin seeds over the top. Really good and tastes a lot like the Sbx Pumpkin Loaf. I made a few modifications. Put in cocnut oil instead of vegetable oil only put in half the brown sugar and white sugar. It was fantastic. This came out delicious and was surprisingly simple to make! I, however, added crushed walnuts on top, before cooking, for a delightful crunch. This is my new favorite pumpkin bread recipe. It’s moist and flavorful. Absolutely delish!